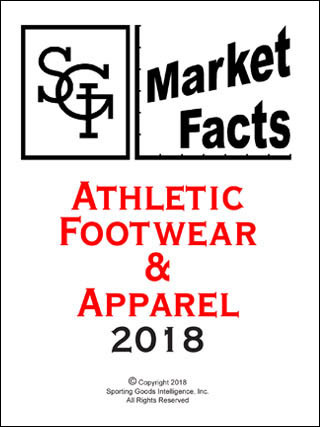 SGI Market Facts - Athletic Footwear & Apparel gives a detailed perspective of the international athletic footwear and apparel markets. The centerpiece of the report is SGI's proprietary, detailed market share tables breaking down revenues and market share of the major athletic footwear, rugged outdoor footwear, outdoor inspired casual footwear and athletic and sports apparel brands and companies. We estimate the total market size, and show you where each company ranks. The report also lists the largest retailers of sporting goods, athletic footwear and apparel worldwide, as well as our exclusive retail square footage expansion projections for the current year. Then, the report looks at the major companies in the market. There is a company snapshot for each of the major brands. Officers, brand names, financials and company news from the past year give you background and context. Stock price charts and financial ratios—ROS, ROA and ROE—plus annual advertising expenditures complete the picture of each company. We've expanded our coverage to include the major players in China. The Chinese sporting goods, athletic footwear and athletic apparel market is booming, with global brands competing with formidable homegrown upstarts. Get the facts and figures on the global athletic footwear, apparel and equipment segments. SGI Market Facts reports feature research and data not found in SGI or anywhere else! Detailed tables, full-color charts, and the cutting edge analysis and conclusions that you've come to expect from the leading authority on the sporting goods market. Here's a list of the companies with their own chapters in the 2018 edition of SGI Market Facts - Athletic Footwear & Apparel. Many other, smaller companies are listed in the market share tables.